I have three children ages 6, 7 and 8. I also have a Bachelor’s degree in Social Work so I am a big proponent of the power of positive reinforcement in promoting good behavior. My husband and I don’t like to constantly “bribe” our children with sweets or toys because we also feel it is important for them to learn the value of earning rewards through their actions of behaviors. 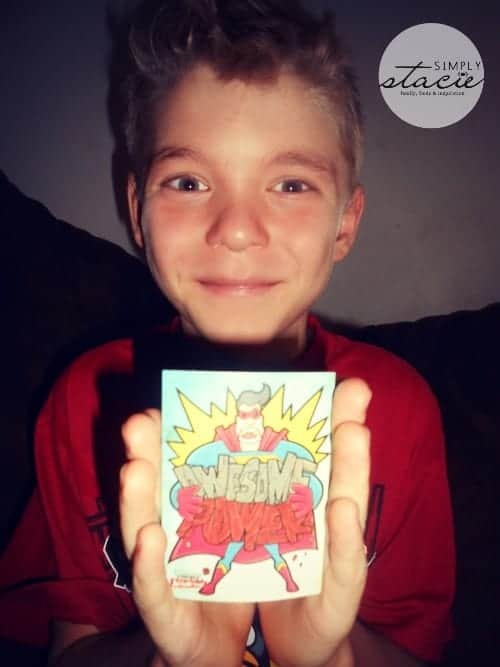 Therefore, I love the concept behind the Awesome Deck of Awesome which is a deck of collectible trading cards for kids to promote positive reinforcement. There are several decks available with either 35 or 70 cards in each deck including the Awesome Deck of Awesome for Girls, the Awesome Deck of Awesome for Boys and Awesome Deck of Awesome Boy & Girl Deck. I really appreciate that these each card has a vibrant, appealing illustration and is made of a very durable stock so kids can collect the cards without it falling apart allowing the cards to be turned in and reused. My husband has been an offset printer for over 23 years and he said that the printing job is excellent quality. Each Awesome Deck of Awesome is open ended allowing the parent or parent/child to discuss how it will work as positive reinforcement and/or as a reward system. In our home, the children enjoy going to our local BMX/Skate Park or playing games on the Kindle Fire. One challenge in our household is frequent spats between the kids and toys strewn about the room. 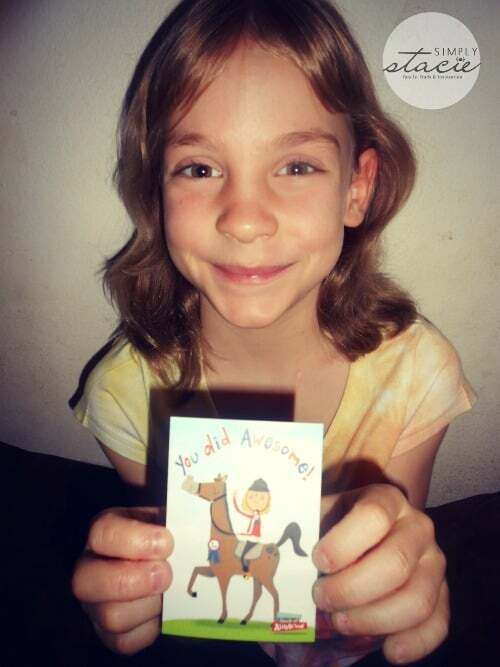 We devised a positive reinforcement reward system where the children can earn a card(s) from the Awesome Deck of Awesome when my husband or I observe team work, problem solving instead of arguing between the kids and or other exceptional behavior. Once they earn a certain number of cards they can turn it into us for a trip to the skate park or time on the Kindle Fire. We have noticed that our children really have made an effort to try to find an alternative to the constant spats and they beam with pride when they are given a card from the Awesome Deck. The Awesome Deck of Awesome was designed by parents for their child and it is a very useful tool if you are looking for a creative way to encourage “awesome” behavior from “awesome” children. You can visit Awesome Deck of Awesome to purchase your Awesome Deck online with prices ranging from $9.45 for a single deck to only $16.45 for a double deck! These would make great stocking stuffers for the holidays too! I learned they have an ‘awesome’ credo and a blog in which they feature an awesome kid of the week. I think my boys would like the awesome deck of awesome boy. I learned that they have some cool free printable contracts for chores and rewards! I like that it is very positive. They have free printable reward contracts. I like that it is positive reinforcement for all ages. I think the motivational advice for children can be very helpful. I like the products come with suggestions and ideas from other parents! positive reinforcement tool for children (of all ages). I learned that they have decks available in boy’s and girl’s 35-card decks, as well as a 70-card boy’s n’ girl’s deck. I like that they have free printable chore/reward charts. I learned you can download an awesome contract for free. I learned that they are good for both boys and girls of all ages. I love the idea of positive reinforcement. The four rules of awesome are, well, awesome. I love the motivational advice for kiddos. I like that they have a boys set, a girls set, and a boys and girls set. I have one of each so that’s my preference. I like that they’re fun and colorful….and who doesn’t like to be told that they’re awesome? I love this idea, helps build self esteem.I like these better than stickers. I learned that each card is unique and has an awesome message to reinforce positive behavior and motivate kids. I like this idea of positive reinforcement for kids! I love that they have free printables on their site. I love how the cards are motivational! I think its important for younger kids!! I like the whole concept – the idea of recognizing kids for positive things (instead of only criticizing or nagging), and reinforcing and recognizing that behavior with a clever idea like this! I like the awesome job astronaut.